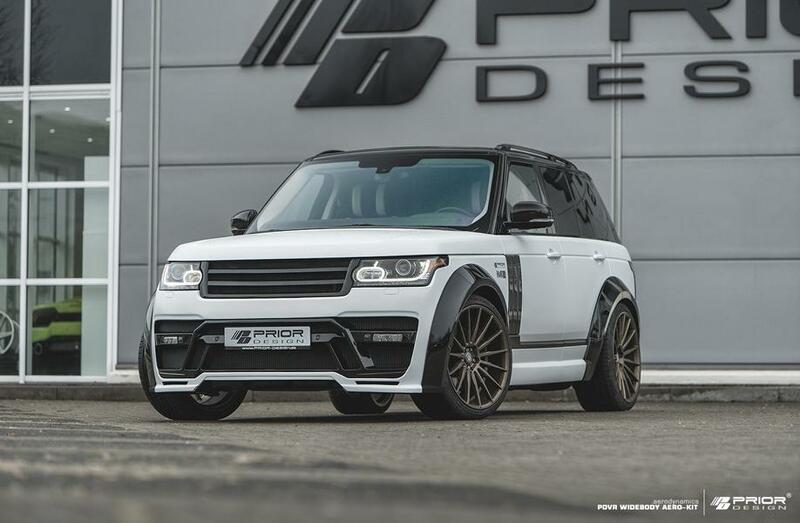 Following new body kits for the Range Rover Evoque and Sport, German tuner Prior Design has shown us a similar package for the fourth-gen, pre-facelift Range Rover L405. The new styling kit lends the luxury SUV an even more impressive, even formidable, appearance. Included are a blacked-out radiator grille, a front spoiler with DRLs, wheel arch extensions complete with matching side skirts, a new rear bumper, and a sporty-looking diffuser. All components are made out of GFRP and Duraflex. For maximum visual appeal, the team suggests painting the Range Rover Mk4 (L405) white while leaving the kit glossy black. You may still order the aero parts painted to match the car body, of course. Other improvements suggested by Prior Design include 23-inch, bronze-colored artFORM AF401 wheels clad in Continental 305/30 R23 tires, and a suspension lowering kit from H&R.